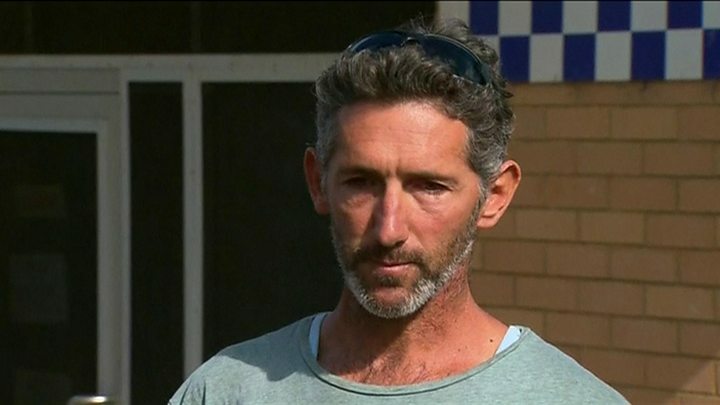 The father of four children found shot dead along with their mother in rural Western Australia has pointed the finger of blame at their grandfather. Aaron Cockman said he believed that Peter Miles, 61, had not "snapped" but had been "thinking this through for a long time". The bodies of Miles, his wife Cynda, daughter Katrina and four grandchildren were found in Osmington on Friday. Police have said they are not looking for any other suspects. They have not confirmed the identity of the killer but say they believe him to be among the dead. Three long firearms found at the property were licensed to Mr Miles, they say. Mr Cockman was estranged from Katrina Miles at the time of the killings. He told reporters he did not feel angry about what had happened, just "tremendous sadness for my kids. I don't want anyone to feel angry". Of Mr Miles, he said: "I still love who Peter was and... if it wasn't for him I wouldn't have Katrina, I wouldn't have any kids. So it's not some random guy off the street who's taken them away from me, he gave them to me and now he's taken them away". Mr Cockman said he believed that Mr Miles had been facing some difficulties. His comments came amid local media reports - citing social media posts published earlier by Katrina - that the children had autism. "Peter has been trying to hold it together for a long time. He's just thought... I can't live anymore, so this is it for me," he is quoted as saying in the Sydney Morning Herald. He said on Sunday he took some solace from knowing his children had died peacefully in their sleep but added: "I've lost everything in my life." Police say they were alerted to the killings by a phone call from a man at the property early on Friday morning. When they arrived, they found the bodies of Peter Miles, outside the property, Cynda, 58, in the house, and Katrina, 35, and her children, Taye, 13, Rylan, 12, Ayre, 10, and Kayden, eight, in a nearby converted shed they were living in. The killings have rocked the tiny rural community of Osmington, which is about 20km (12 miles) from Margaret River, a popular tourist and wine-growing area.